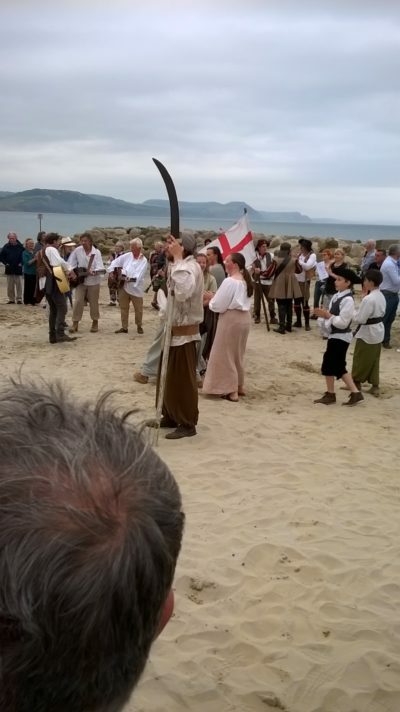 Having gathered a good few early arrivers beneath a flag of St George and attempted to rally them with stirring song and seditious verse, a small but enthusiastic band of rebels await the arrival of their leader, James Scott, 1st Duke of Monmouth on the beach at Lyme Regis. In the late afternoon sun it has the lackadaisical feel of a seaside wheeze, wholly at odds with the very real passions and ire felt by those who gathered not far from the same spot on 11 June 1685 to take down a king. 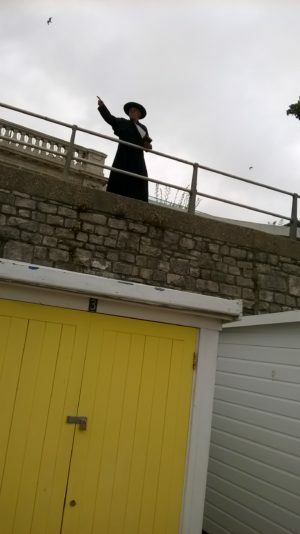 For it was then that Monmouth, a Protestant and the eldest son of Charles II, landed at Lyme Regis with 82 men intent on overthrowing his Catholic uncle, James II. By the end of the first day the ranks had swollen to 300, within four days more than a thousand were ready to march on Bristol attracting more as they headed north into Somerset. At its peak the rebel army was some 6000 strong, although being largely made up of farm workers, artisans and religious dissenters it was never going to be a match for well-drilled Royalist troops. Foul weather, a failed Scottish rebellion, the lack of reinforcements and the offer of a royal pardon to those who stood down all depleted Monmouth’s force, which was finally routed at Sedgemoor in what is widely considered the last pitched battle fought on English soil. The Duke was captured near Horton and executed in a botched beheading before the notorious Judge Jeffries swept through the West Country presiding over the Bloody Assizes in which 320 apparent rebels were sentenced to death (including 12 executed as traitors on the beach at Lyme) and some 800 others transported as slaves to the West Indies. It’s powerful history that pitched village against village, father against son, brother against brother and with its terrible aftermath, its pull continues to be felt throughout the region to this day. 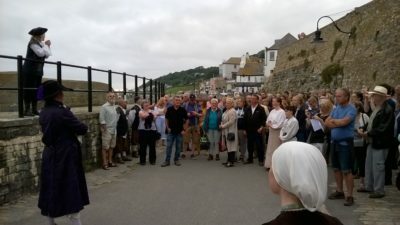 So those 200 souls that packed the sold-out Marine Theatre for the penultiumate performance of Lyme’s community play bore appreciative witness to the tip of that history, as a cast of locals, many acting for the first time, relayed the great story with as much passion as enthusiasm and no small amount of skill. Commissioned by the Marine’s outgoing artistic director Clemmie Reynolds, screen writer (and son of Lyme) Andy Rattenbury followed up his sterling work on last year’s community play Tempest of Lyme with a superb script that makes light work of the historical exposition describing events through the memories of the 70-year-old Alice Hawkier who as a ballsy 18-year-old had posed as a boy and found herself recruited as Monmouth’s valet. The action was superbly staged with back projection connecting it to modern Lyme and current affairs; while the use of music to conjure period atmosphere and aural descriptions was both inventive and extremely effective. Anne King made an engaging narrator as the aged Alice with Georgia Robson her equal as her younger self. Nick Ivins as Monmouth was suitably charismatic and Brian Rattenbury and Harriet Dickson stood out as the comically feuding husband and wife Sampson and Marnie Larke, but in truth the success of the production was an ensemble effort and caps should be doffed to all the actors, musicians and off-stage hands. A play of and by the community of Lyme Regis, this was directed with bags of brio by Clemmie Reynolds, who, in a clear parallel with Monmouth’s venture, managed to turn a raggle taggle company of non-actors into a serviceable band of players. That she is now to depart the Marine is Lyme’s loss, as she takes a version of the play out on tour this autumn while the theatre prepares to tread a different path that could well bring the curtain down on similar ventures, at least for the time being.